While the sunset colors enhance the beauty of Lake Audy in Riding Mountain National Park in Manitoba, Canada, two young boys hold up their prizes after fishing off the wharf. People fishing at Lake Audy can catch different species of fish with the more popular types being northern pike, walleye, trout or perch, whether they are fishing from the wharf or in a boat. The boys have had their first taste of fishing while at Lake Audy and after a good nights sleep, you can be sure they will be back out on the wharf for another fishing expedition. Young boys holding up their catches after fishing from a wharf on Lake Audy during sunset, Riding Mountain National Park, Manitoba, Canada. 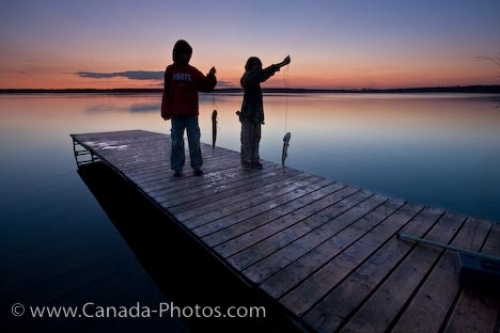 Picture of two young boys showing off their catch after fishing off the wharf at Lake Audy in Manitoba, Canada at sunset.